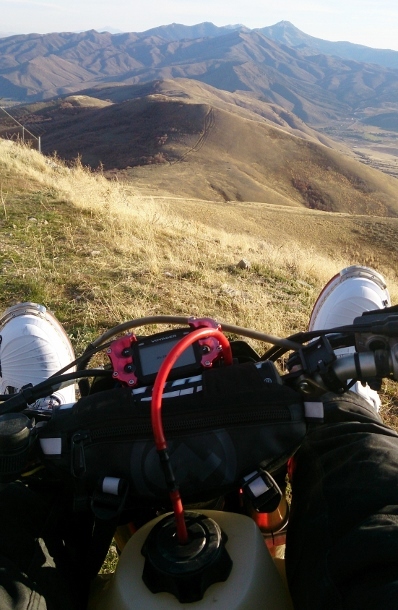 This year, during the week-long Tour of Idaho, I experienced the agony of ill-fitting boots. Though my Tour boots were of top-quality and were sized correctly, they still did not fit my extremely wide (especially in the forefoot) size 13 feet. It's difficult to get a top-level MX boot for a wide foot without just settling for one that's a size large, still not wide enough in the front, and way too wide in the heel. My impression of most premium MX boots is that they offer great protection, but that fit is an issue, unless you have a pretty generic foot. Boots labeled as "Enduro" are typically mid-level boots that do not offer premium levels of ruggedness or of protection. I had 1500 miles to ponder all of this as my popular, highly regarded MX boots tortured my feet. When I got back from the Tour, I paid a visit to our go-to counterman at Pocatello Power Sports, Brian Jablonski, to sort out some options. A few weeks of research led us to the Gaerne SG12. I could go on about the ARCONOS gaiter (which is actually pretty cool), the alloy buckles, the dual pivot system, the thermoplastic shin plate, the grip guards, the heel and toe cups and all the rest of the bells and whistles, but I'll let the folks at Gaerne do that for themselves. What I'm here to tell you right now is that I've finally found the boots that I want to keep. The SG12's are definitely the best MX boots I've worn, probably the best motorcycle boots I've worn, and darned near the best really heavy duty boots I've ever worn for any purpose. The SG12's remind me of a set of good mountaineering boots that fit just right. You know that you are as protected as you need to be, but you can still, without undue hardship, get the boots on before you go out, get them off after you get back, and live with them in between. You'd be surprised how often all of that can't be strung together no matter how much you pay to make it happen. After trying on several pairs of SG12's that were not quite right (Italian boot sizes are a standard unto themselves), I had Brian order up the red, white and blue beauties pictured in the lede. They fit very well right out of the box. Even though the most recent iteration of the SG12 is supposed to have a smaller toe box than it's predecessor, it's still pretty roomy up front. But this was a relatively minor (within the realm of an insole) concern. The insole that comes with the SG12's is actually pretty good, so rather than replace it, I simply had local boot expert Jason Smoot shim up the insoles just a smidgen in the forefoot area. Nirvana! The first thing that you'll notice about the SG12 is that the sole has a distinctive rocker shape that you will feel while walking around. It takes a bit of getting used to, but after a ride or so I learned to really like the way it positioned my feet on the foot pegs. The toe box is really tall (I measured them at a full 1/4" taller than my old boots) so shifting in the SG12's takes some getting used to. I did not have to adjust my shift lever, but some might. The SG12 is also a pretty beefy boot (especially coming from a SIDI Crossfire), and you'll probably notice the extra heft and bulk. But the exemplary feature, at least in my opinion, of the SG12's is how easy they are to get on and off. After years of fiddling with funky inner boots and liners, the SG12's are a snap. Ten seconds on or off, with no flaps or liners or straps to worry about getting lined up or tucked in properly. As of this writing, I have logged about a month and many hundreds of miles in my SG12's in terrain that has varied from gnarly single track, to mud, to sand to high-speed sorties down dirt roads. I have yet to find any circumstance in which the SG12's didn't do what they were supposed to, or were uncomfortable. The darned things just work. In my estimation, the Gaerne SG12 boot is the rare case of something that happens to be everything it's cracked up to be. 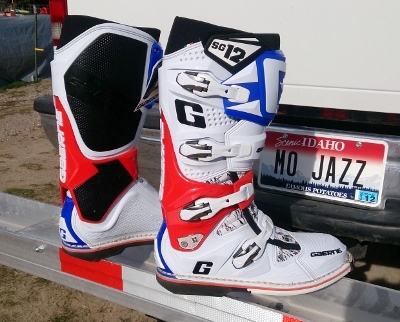 Update, 2/7/04 - While working at King of the Motos last week, I discovered that the SG12's are as comfortable, while being far more supportive, that medium weight Gore-Tex hiking boots in rocks and scree. I hiked for miles in my SG12's over the course of three days and have no concerns whatsoever about being able to hike long distances in them should the need arise. The Good: A premium boot that is comfy, rugged and easy to get on and off. The Rad: Snazzy colors and upscale general appearance make you look and feel really fast. The Gnarly: Does little to actually increase your speed.